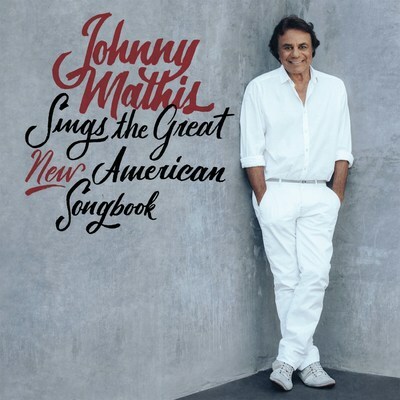 NEW YORK, Sept. 29, 2017 /PRNewswire/ -- Legendary vocalist Johnny Mathis releases his new album, Johnny Mathis Sings The Great New American Songbook today September 29. The album features 11 inspired Mathis interpretations of prevailing current songs that comprise the modern great American songbook, all imbued with the iconic vocalist's indelible touch. The new album is available here: http://smarturl.it/MathisSongbook. Produced by Grammy winning music greats Kenneth 'Babyface' Edmonds and Clive Davis, Johnny Mathis Sings The Great New American Songbook features a matchless array of modern day 'standards' christened by Mathis' intuitive delivery, (full track listing below). Among the songs included are "Hello," originally recorded by Adele, "Happy," originally recorded by Pharrell, the aforementioned "Hallelujah," originally recorded by Leonard Cohen, "You Raise Me Up," originally recorded by Josh Groban, "I Believe I Can Fly," originally recorded by R. Kelly, "Just The Way You Are," originally recorded by Bruno Mars, and "Run To You," (featuring Kenny G) originally recorded by Whitney Houston. Check out an exclusive look at the album here: http://smarturl.it/MathisEPK. One of the seminal voices of popular music, Johnny Mathis has attained unparalleled achievement as a recording artist and live performer in an incredible career that has spanned more than six decades. Universally recognized for his inimitable artistry and signature renderings of the American song catalogue, his vast stylistic range has encompassed romantic interpretations of jazz and pop standards, music composed for stage and film, contemporary pop hits, and holiday music both sacred and secular, enduring as one of the most acclaimed traditional pop vocalists in music history. Legacy Recordings, the catalog division of Sony Music Entertainment, is set to release The Voice of Romance: The Columbia Original Album Collection, the definitive Johnny Mathis career-spanning box set at the end of the year. The 68-disc set comes as a part of the continued celebration of the enduring musical achievements of Johnny Mathis (who first signed with Columbia Records in 1955.) Legacy has worked closely with Mathis on the curation of his Columbia catalog, pouring through the label's deep archive of studio and live material, restoring and remastering tracks for digital release. Within this vast career-spanning boxset, Legacy Recordings has included 62 Columbia albums that have been remastered (25 of which are available on CD for the very first time), two previously unreleased albums, a 2-disc collection featuring 40 previously unreleased songs as well as Johnny Mathis Sings The Great New American Songbook. Signed to Columbia Records in the mid-1950's, Johnny Mathis was one of the very first musical artists to embrace the album concept and record fully-realized thematically and sonically coherent collections of songs. His 1958 release, Johnny's Greatest Hits inaugurated the ongoing "greatest hits" anthology phenomenon becoming one of the most popular albums of all time after spending an unprecedented 490 continuous weeks (almost ten years) on the Billboard Top Albums Chart. To date, Johnny Mathis has had 3 songs inducted into the Grammy Hall of Fame, achieved 50 hits on Billboard's Adult Contemporary Chart, and ranks as the #6 all-time album artist in the history of Billboard's pop album charts. He has received 5 Grammy Nominations, and in 2003 he was given the Lifetime Achievement Award from the Academy of Recording Arts and Science.